As a service provider, customer success is top priority for Version 1. With a strong focus on meeting its customers’ needs, the brand wanted to implement training, mandatory and soft-skills, that would ensure every employee was getting the right training, at the right time. The company had been doing some face-to-face training, albeit it was sporadic and often off-the-cuff. And being a rapidly expanding business, this made employee education a manual, tedious task to track. Version 1 decided to invest in a learning management system. 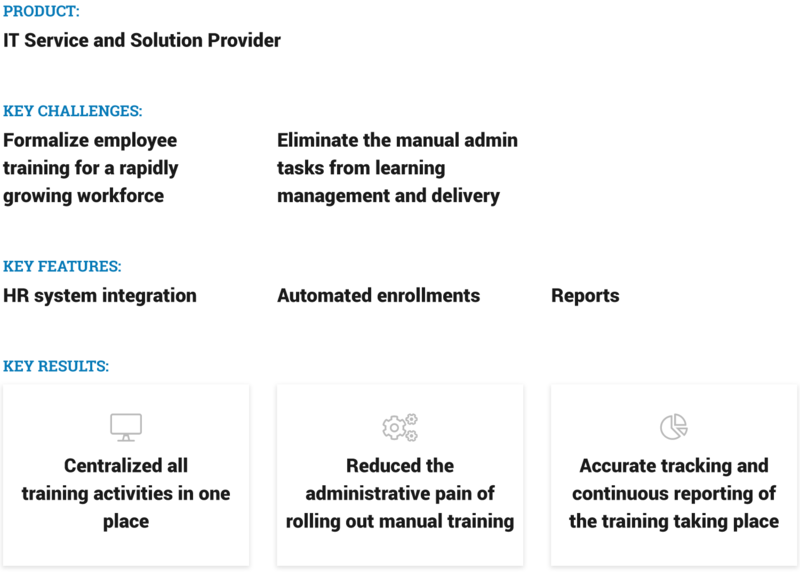 One that would remove the manual process from delivering training, enable them to efficiently train each employee, and importantly, measure the learning that’s happening throughout the organization. Version 1 singled out LearnUpon LMS as the solution for their training needs. And the platform proved to have the vital features they wanted to deliver impactful training within the business. Principally, LearnUpon helped to centralize training. All of the learning activity taking place, the content being used, the employees receiving training, is now all held in one, easily accessible location. Not only is everything consolidated, but it’s also much simpler to manage. Version 1’s learning and development team have taken advantage of LearnUpon’s automation features that make their everyday tasks simpler. Integrating with the HR software, BambooHR, means every new hire that joins is automatically added to the LMS. They’re enrolled in their courses, get notifications about their training, and are automatically removed when they leave the company. Even reporting on the learning taking place is much more efficient. Laborious manual tracking is no more. The team can effortlessly see exactly what learning is happening by who and when in just a few clicks. As a team ramping up their training efforts, it’s not just the features of LearnUpon that Version 1 appreciate, it’s the on-going support they receive too. Looking to the future, Version 1 is planning to significantly expand the learning activities on offer to their employees. From an onboarding suite of training to learning paths to additional mandatory training, the team is going full steam ahead, developing automated, measurable training through LearnUpon LMS.